I’m not a huge fan of Ben Stiller, I don’t think he’s a very reliable director or a versatile actor and find he most of the time looks fairly annoying. Nevertheless he’s usually perfect for the roles he plays. I’m a bigger fan his father, Jerry Stiller really. 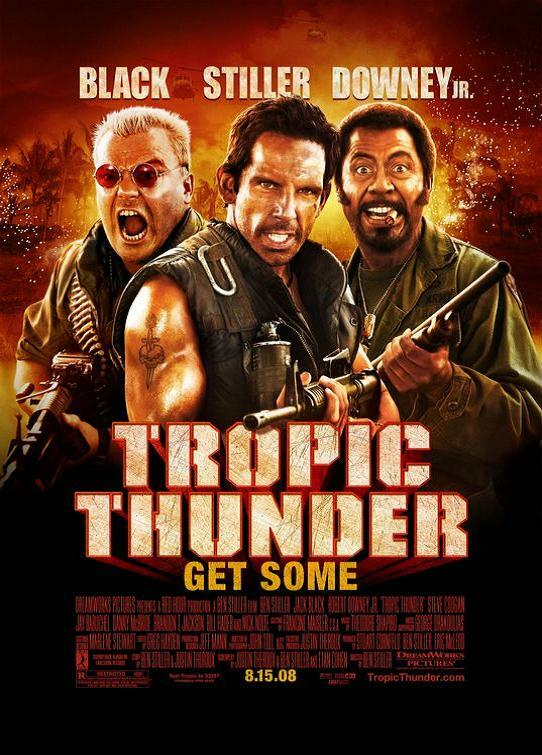 I have to say Tropic Thunder is Ben Stiller’s best to date. Action packed and clever comedy. Spoof is the word I suppose. Obviously a spoof of war films. But not quite to the extent that Hot Shots and the likes go. But that’s a good thing; there’s a bit of originality left. Most of all I was amazed to see Tom Cruise‘s face too. I didn’t know he’s in this movie and then he turns up and goes on to deliver probably one of his best on screen performances ever. Jack Black, Robert Downey Jr. and Brandon T. Jackson have decent roles to act as well, while Downey’s one is probably the one most talked about. And he even has an Oscar nomination for the role. So, this was ok. Almost funny at points. And so it should, it’s a comedy after all. I just wish Tom Cruise’s part was bigger. This entry was posted in Reviews and tagged Ben Stiller, comedy, Oscar nomination, spoof, Tom Cruise, Tropic Thunder by Ozz. Bookmark the permalink.